StruBIM Design is a tool for the design, checking and editing of structural elements of reinforced concrete, steel, or composites of both steel and concrete based on a structural model and a calculated analytical model. The structural model can be imported by using a file of XML format or IFC format, either generated from CYPE IFC Builder or other BIM modeling programs. The calculated analytical model is imported from StruBIM ANALYSIS or from an XML file, provided that it contains the necessary information. StruBIM Design carries out the automatic design and checking of the structural elements, columns, beams, slabs, and walls, and obtains drawing plans according to the needs of the project (Record Engineer). The program carries out checks of punching shear of slabs on columns without beams. It automatically generates the critical section for each column that transmits stresses to the slab. In this critical section, it verifies the resistance to tangential tension in slabs resisting flexure in both directions. The results of the automatic design process can be edited and the checking process can be carried out after changes are made, both in reinforced concrete (sections and reinforcements) and in steel sections. The following images show the sign convention used for each element, indicating the directions for positive values of each force. For steel columns and beams, ANSI/AISC 360-10 is used. For composite columns of concrete and steel, ANSI/AISC 360-10 is used in combination with versions 08, 11 and 14 of ACI 318. For the automatic design and checking of slabs and walls, StruBIM Design processes the results from the analysis based on the finite element method. This analysis produces solutions in specific points of the 2D structure, according to the discretization established. Based on these solutions, necessary values are obtained for automatic design and reinforcement through the generation of integration strips in the 2D element and the calculation of the resultant in the corresponding design section. The program offers the possibility of calculating the aforementioned resultant by applying either the method of “integration of internal forces” or the method of “integration of nodal forces”. The first premise is to have available the internal forces and/or nodal forces in the 2D elements being considered for the application of one method or the other. Depending on the source of the analytical model (xml, sbar, etc. ), the data available for calculation may vary. It is evident that when we only have one of the two data types available, only the corresponding method can be applied. In the case where both internal forces and nodal forces are available, the user may select which method is appropriate. For guidance, more information about both methods is provided below. The method of integration of nodal forces provides very good results when the integration strip for the calculation of the resultant extends along the width of the 2D element, independent of the capacity of discretization utilized, as with the case of walls in StruBIM Design. When this method is utilized and the width of the strip is more limited, it is recommended to use a refined discretization of the 2D element. The method of integration of internal forces provides very good results when the width of the integration strip is more limited, as is the case for the calculation of necessary areas for slabs in StruBIM Design. To take into account the variability of live loading in the design of beams, the program creates automatic load combinations of Live loads and Dead loads. This is applied to factored live loads. For example, if we have defined a combination A (1’2 D + 1’6 L), the beams will be designed with the moments of combination A and an additional combination A’ (1’2 D + factor • 1’6 L). In this additional combination, the design moment of the live load is calculated as if all the beams were pinned. This set of tools permits different types of columns to be designed and checked. The information is organized in a table of columns and floors referred to as the Column schedule. A summary check list can be generated of the checks that are carried out. The checks are carried out in each point of defined forces. In this list the resulting worst points are shown. The columns schedule and a drawing of the reference sections are presented in drawings, which can also be generated by the user. The program designs and checks columns with rectangular or circular cross-sections. In rectangular columns, longitudinal and transverse reinforcement may be defined through stirrups. In circular columns, longitudinal and transverse reinforcement may be defined through stirrups/ties or through spirals. The program automatically determines the free length of the column according to the length of the imported bar. The value is determined by default equal to 1. The program calculates δns according to the selected design code, although it allows for editing. Cm: Moment coefficient. Pu: Applied axial force. Ig: Moment of Inertia of the gross concrete section, disregarding reinforcement. The program calculates Cm according to the selected design code, although it allows for editing. M1 y M2 are the moments at the ends of the column, M1 being the lesser moment. M1/M2 is negative if the column is in simple curvature and positive if it is in double curvature. Separate factor for each axis. The program assumes that second order effects (P-Δ) have been taken into account in the analysis; therefore, the program determines the value by default δs=1. The factor δs amplifies the moments produced for loading cases such as Wind loads, Seismic loads and Seismic loads (Drift). Forces in the case of Reducible live loads are multiplied by this factor. StruBIM Design automatically determines the free length of the column according to the length of the imported bar if the project has been introduced by means of a BIM model. The program automatically determines the free length of the column according to the length of the imported bar if the project has been introduced by means of a BIM model. Separate factor for buckling around each axis and for torsion. The value is determined by default equal to 1. Separate factor for buckling around each axis in steel columns. The value is determined by default equal to 1. Separate factor for buckling around each axis in steel columns. This factor allows moments to be amplified in the cases of Wind loads, Seismic loads and Seismic loads (Drift). The value is determined by default equal to 1. The program automatically determines the free length of the column according to the length of the imported bar if the project has been introduced through a BIM model. Separate factor for flexure around each axis. The value is determined by default equal to 1. Separate factor for buckling around each axis in steel columns. This factor allows moments to be amplified in the cases of Wind loads, Seismic loads and Seismic loads (Drift).The value is determined by default equal to 1. This set of tools permits walls of reinforced concrete to be designed and checked. The information is organized into a table of walls and floors. A summary check list can be generated of the checks that are carried out. The checks are carried out in the transverse section located at the beginning and ending level of each shell that make up the wall. The resulting worst points are shown in this list. A table of the reinforcement of each wall along with the reference section can be seen in the drawings. A shear wall can be composed of various sections of different thickness. Each part of the wall can be assigned a different reinforcement strip. In turn, reinforcement can be defined in each reinforcement strip by side or by reinforcement of the confinement (of the column type). Face reinforcement: A bar diameter is defined along with a spacing for horizontal and vertical reinforcement, which will be equal for both sides. Confinement reinforcement: The number of longitudinal bars for each side and their diameter is defined, as well as a transversal reinforcement composed of closed stirrups and intermediate legs. The program checks and designs the reinforcement according to the selected type. The program automatically determines the unbraced length of the walls according to the designs of the plates which define it if the project has been introduced through a BIM model. The program calculates δns according to the selected design code, similar to that carried out with the columns, although it allows for editing. The program calculates Cm according to the selected design code, similar to that carried out for the columns, although it allows for editing. The program determines the value of ρl,min according to the selected design code, although it allows for editing. The program determines the value of ρl,min 1 according to the selected design code, although it allows for editing. This ratio is used to calculate ρl,min 1; the program automatically determines the value of this ratio with a minimum value of 0.5 ( hw/lw ≥ 0.5). Concrete and steel beam design is carried out in the corresponding beam schedule. A summary check list can be generated of the checks that are carried out. 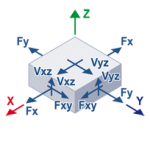 The checks are carried out in each point of defined forces. The summary check list shows the resulting worst points. At a minimum, each section of the beam must have at least three points of forces for the checks to be carried out. In addition to each floor plan, a concrete beams schedule and a steel beams schedule can be added to the drawings. The reinforcement defined in the columns schedule refers to a previously defined detail type. The program allows the definition of a detail type with different arrangements of reinforcement, for the top reinforcement there is a choice between continuous without additional reinforcement and continuous with additional reinforcement in the supports. For the bottom reinforcement there is a choice between continuous without additional reinforcement, continuous with additional reinforcement at the supports and continuous with additional reinforcement at the mid-span. All beams in each project will contain reference to only one detail type. The different beam sections arranged about the floor plans can combine to form continuous beams composed of various sections. The additional reinforcements in intermediate supports will pass from one section to another. The program also allows for the automatic generation of continuous beams. The mechanical cover is used during the automatic design phase of reinforcements in order to calculate the necessary areas when there are no defined reinforcements in the beam. In the case in which the beam has arranged reinforcement the mechanical cover will be calculated. Torsional moments cannot be reduced by the redistribution of internal forces. This is identified as “equilibrium torsion,” because the torsional moment is required for the structure to be in equilibrium. Torsional moment can be reduced by the redistribution of internal forces after cracking if the torsion results from the member twisting to maintain compatibility of deformations. The program checks to ensure that the continuous top reinforcement of the perimeter beams of the structure is greater than or equal to a sixth of the tensile reinforcement required for negative moments and not less than two bars. The program automatically calculates the unbraced length from the length of the beam and the size of the supports, although it allows for editing. The program automatically calculates the unbraced length from the length of the beam and the size of the supports, although it allows a different length to be defined for the top or for the bottom. The value is determined by default equal to 1, although it allows a different length to be defined for the top or for the bottom. Separate factor for buckling around each axis. The value is determined by default equal to 1. Separate factor for buckling around each axis. This factor allows moments to be amplified for Wind loads, Seismic loads and Seismic loads (Drift).The value is determined by default equal to 1. This toolset permits solid slabs of reinforced concrete to be designed and checked. The checks for strength and minimum longitudinal flexural reinforcement are carried out for each point of forces in the slab. The checks for maximum and minimum spacing are carried out in each group of defined reinforcement, either continuous reinforcement or additional reinforcements. The top part of the slab is placed in the positive local Z axis. This consideration should be taken into account when defining the forces of the slab or importing them. When creating a Project from a BIM model it is important to ensure that the local Z axis of the sheet that defines the slab is vertical and with positive upward direction. When the points that define the slab are arranged in a clockwise direction it is not possible to correctly determine the axes of the structural element; in this case, the program will generate advisement during the import process. StruBIM Design carries out checks for punching shear of slabs on columns without beams. The program automatically generates the critical section for each one of the columns that transfers stress to the slab. 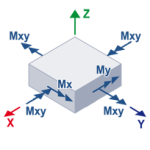 In this critical section, it verifies if the resistance is exceeded against tangential tensions for slabs resisting flexure in two directions. The program allows the introduction of two types of reinforcements against punching shear: stirrups or headed studs. The strength in the inner and outer perimeters of such reinforcement is verified. As well, the program verifies the geometrical distributions and reinforcements according to the standards of calculation. It can modify the arrangement of the columns if they are interior, edge or on a corner. It can modify the effective slab depth, the maximum and minimum support width, the critical section of both the support and the reinforcement, taking into account gaps and edges, indicating the effective segments opposing punching shear. It can also modify the data for reinforcements such as stirrups/ties and studs. On the other hand, the stresses of each support can be consulted at the head and base, whose difference provides the punching shear forces that are transmitted to the slab in the floor.